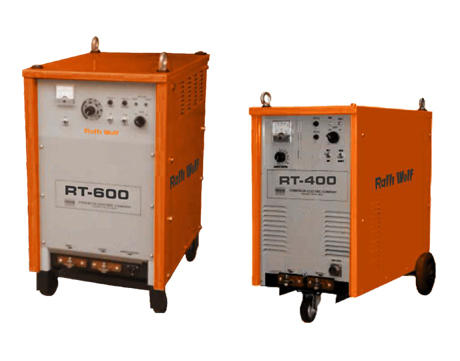 Thyristorised DC Manual Arc Welding Rectifier RT-400 / 600 with true vertical current characteristics ensures stable, constant current output The machine is suitable for MMA/TIG/Gouging application. The rugged, Heavy duty power source is equipped with Hot start / Arc force, electrodes Anti-sticking facility and Remote Control. The machines can be used with long extended cables at a distance of 100 metres from the power source. High open circuit voltage ensures easy arc striking with all types of electrodes – The machine can be operated from captive alternator sets.